Organizations have different theories about what constitutes a stellar, on-the-job training program. For instance, some businesses implement “lunch and learn” programs where the business caters lunch and brings in a speaker to give a series of high-level lectures and workshops to employees. Others feel that hiring an outside organization to create custom-built training programs for their organization is better for attracting, educating, promoting, and retaining their workforce. Follow the three steps below determine which on-the-job training methods are best suited for your organization and to create a training plan for employees. Before we explain how to create a training program, let’s define on-the-job training programs and their potential impact on your business. The name pretty much speaks for itself—on-the-job training involves teaching skills and knowledge that employees need to perform a specific job within their workplace. Over half of employees leaving companies report that one reason for leaving was not being offered any training. Employees who are offered on-the-job training programs are 30% happier with their careers than those who receive no training. 73% of companies will see a higher application rate when offering on-the-job training. 87% of millennials report on-the-job training methods are important to them when searching for a job. Now learn how to create a training program for your employees—you know it’ll pay off. Before you begin, you first must determine what type of training you need. Is it for a particular department? Is it a company-wide training? Or do you need a series of training exercises for various roles throughout your organization? Determine the goals for your on-the-job training program, and the appropriate method will follow. For example, many large-scale companies that employ call centers create customized training for each level of employees within the call center to ensure high-quality customer service as well as consistent brand messaging. Smaller, upscale companies might bring in consultants from local colleges and universities to customize trainings that are built from the college’s curriculums. Don’t have the budget for certain on-the-job training methods, such as hiring outside consultants? Consider identifying or hiring internal subject matter experts (SMEs) or instructional designers to craft company-specific and branded trainings for your employees. As you think about the goals you want to accomplish with a training program, keep in mind that, by providing on-the-job training, you’ll be able to cultivate a pool of promotable employees—all while attracting (and retaining) higher quality candidates who are more likely to stay loyal to your organization. Additionally, managers will be able to justify raises, promotions, and lateral moves after employees have gone through specific training that matches their career interests. If you want to know how to create a training program that truly drives results, your next step will require you to think like a college professor. Ask yourself what you want out of your employees—what skills would you like them to gain? And how are you going to determine whether they have learned the material? Much of corporate training relies on competency-based education (CBE). Simply put, CBE does away with the traditional forms of learning (i.e., class lectures, midterms, papers, exams, and grades). In a competency-based program, in order to pass one’s training, all the professional needs to do is prove, by example, that he or she is effectively competent at a skill or set of skills. Your training program should mimic this process. Why? Because adults tend to learn by doing, rather than by being told what to do or lectured. By creating a set of competencies in your on-the-job training programs, you’ll be able to effectively identify what you want your employees to learn across all department levels. More importantly, you’ll establish a way to effectively track whether the training is effective. Once you’ve determined your learning outcomes and goals, it’s time to do some research. What resources does your organization currently have that it could allocate towards its own on-the-job training programs? If you have a significant source of funding, you should absolutely consider outsourcing this work to local or national professional development training companies. Many institutions of higher education (on both the local and national level) offer customized training packages from the college or university’s own curriculum. Imagine pitching your employees or applicants with an “on-the-job MBA” or bachelor’s degree from a school they admire. Organizations with little to no funding should absolutely lean towards developing internal solutions. Some great options are hiring SMEs or instructional designers (for either a full-time internal position or a contracted position) to create curriculums for your needs. If you’re really strapped for funds, consider tasking some current employees (managers, HR members, or employees with an education background) with creating on-the-job training methods. It’ll be a win-win for the team who develops the curriculum (perhaps aligning career goals with a lateral promotion?) as well as the employees who receive the training. Once you have followed the three steps above and determined the purpose and source of your on-the-job training program, you can start to build out all the content. 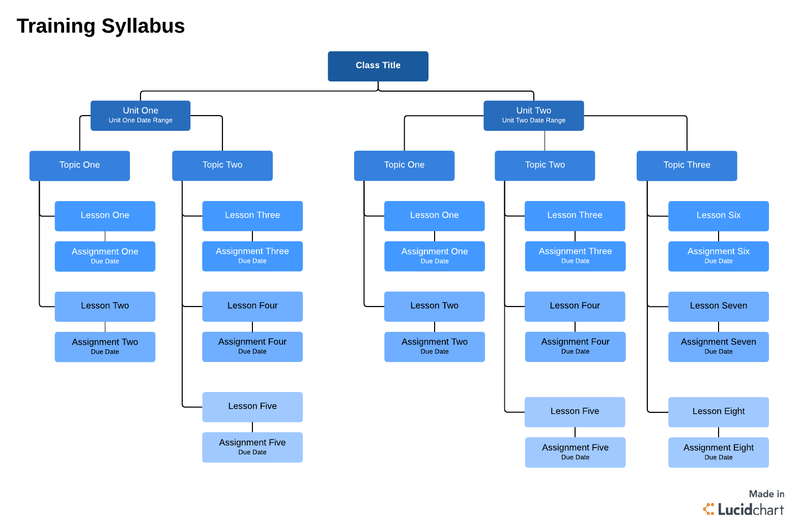 Use Lucidchart to create a timeline or swimlane diagram to plan out the development of your course and delegate responsibilities. And as you create the content for your training program, remember that many of your employees will be visual learners—so work in visuals to help them understand and retain the information you present. For example, try out the visual syllabus template below to show your employees what a particular course will cover. 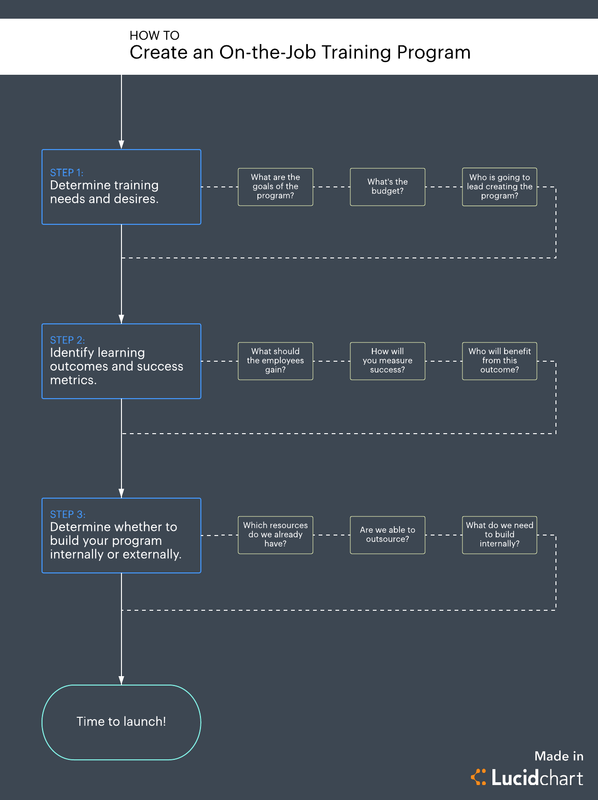 Keep your training on track with Lucidchart. Start your free account or click any of the templates above to get working right away.